Male pronghorn, on the run. Photo by Great Beyond. Meanwhile, over at The Molecular Ecologist, I interviewed my old friend Stacey Dunn about a study of hers recently published in Science, which presents ten years of data to examine how A.J. Bateman’s principal of sexual selection — that males maximize their evolutionary fitness by mating with lots of females, but females maximize their fitness by mating with just one or a few carefully-chosen males — in pronghorn. 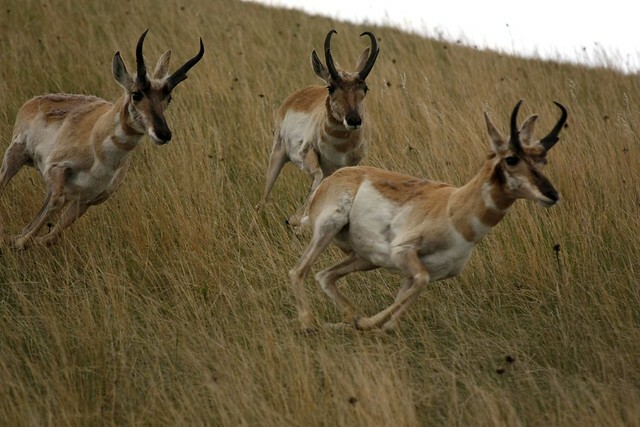 The National Bison Range pronghorn have been studied extensively by John [Byers] and his lab since 1981. Each spring, we captured nearly all fawns born in the population. During captures, we weighed, measured, sexed and tagged the fawns and took a tissue sample for genetic analysis. We genotyped each individual alive since 1999 at 19 microsatellite loci. We determined paternity for all fawns based on genotype. Maternity was known from fawn captures, but was also confirmed genetically. We then used that information to reconstruct a multi-generational pedigree of the pronghorn population.